An excellent gift that is sure to satisfy and bring a smile to any shutterbug's face would be the instax SQUARE SQ6 camera from Fujifilm. The last few years have seen instant film cameras make a big comeback and Fujifilm's instax series are among the most popular instant cameras out there. The new instax SQ6 is a square format analogue instant camera that has a number of shooting functions ideal for everyday use. Some of the key features are auto exposure control, selfie mode/selfie mirror, double exposure mode, lighten/darken mode and landscape/macro mode. The camera also comes with 3 different colour filters, which attach to the flash. These allow you to add purple, green and orange overtones to your shots, instantly changing the mood of the photograph. The camera has a simple yet stylish design and its portable size makes it ideal for everyday use and while travelling. The instax SQ6 has an RRP of £124.99 and comes with two CR2/DL CR2 lithium batteries, a shoulder strap and three flash filters. You can buy it from Currys PC World, Jessops, Argos, Amazon and John Lewis. The instax SQUARE Instant Film Twin Pack (20 shots) have to be purchased separately and have an RRP of £16.99. For skincare and beauty lovers of all ages, an excellent gift idea would be the Magnitone Barefaced 2 Cleansing and Toning Brush. It is a fabulous tool that cleanses, massages and tones the skin leaving it softer and healthier-looking. I have used cleansing brushes in the past but this is a dual action device - it cleanses and it tones. Based on my experience (I have normal skin that tends to become sensitised every now and then due to the medication I am on), the brush works well for sensitised skin as well. There is a separate mode for that. The brush makes use of the award-winning 3D Vibra-Sonic technology that combines sonic oscillations and pulsed vibrations (13,000 times per minute) to deliver a deep pore cleansing action. The brush's design is elegant and sleek and the brush heads, I feel, are the right size. Using it is also pretty simple and straight-forward. And in the few weeks that I have used this brush, I feel that my skin now looks healthier compared to earlier. In addition to cleansing, the brush boosts circulation which in turn makes the skin appear healthier. One of the finest whiskies we have tried and one which has become a favourite at our home since being introduced to us last year is the Bruichladdich Classic Laddie whisky. Crafted by master distiller Jim McEwan, this single malt Scotch whisky is matured for its entire life by the shores of Loch Indaal, thus showcasing the classic, floral and elegant Bruichladdich house style. It is different! It is not as peaty as you would expect. Bruichladdich have tried something different and have come up with a great whisky as a result. It smells amazing - a little deceptively sweet initially and then giving way to a more complex scent - a bit of the salty seaside, some fruity notes and perhaps a mint note. It is smooth and has quite a warming burn which lovers of fine whisky will enjoy. It has an RRP of £41.99 but is currently available for a discounted rate on Amazon UK. For PS4 lovers, Starlink: Battle for Atlas would make a great gift. The action adventure game makes use of innovative modular toys that can be mounted to the game controller to interact directly with the game. You can mix and match gear etc. allowing you to build unique starships. It is an interesting and new way to play and is a game for all ages. 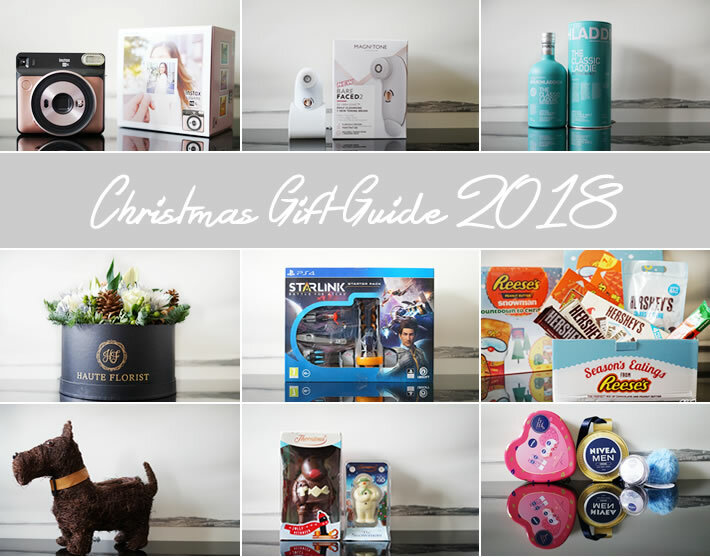 For chocolate lovers, you need to check out Reese's and Hershey's Chocolate Collection for Christmas 2018. It is a yummy collection featuring some new additions and some classics that have received a makeover! From the Reese's Christmas Collection, the following would make good picks, Reese’s Half Pound Peanut Butter Cups, Reese’s Lovers 7 Pack Selection Box, the classic Reese’s Snowman or the Reese’s Christmas Tree. You could make up a chocolate hamper featuring some or all of these products. You could also add in some of Hershey's Christmas offerings like the Hershey’s Selection Box or the Hershey’s Cookies n Crème Family Sharing Bag. The Hershey’s range is available to buy from Tesco while the Reese’s range can be picked up from Tesco, Asda, Morrison’s, Sainsbury’s and other high street retailers. This Brushwood dog planter from the Basket Company is so cute that I couldn't resist including it in guide. I feel it would make a lovely, little gift for plant lovers or dog lovers. Made from Brushwood and with a rustic texture this planter is perfect for the garden or conservatory. And it is only priced at £8.00. The latest addition to Thorntons range of Christmas models is the Cheeky Elf which is made with delicious milk chocolate and has intricate details (a white chocolate collar and striped trousers). This new model joins a cast of Thorntons other seasonal stars which include the Jolly Reindeer and the Snowman, both of which are featured in this post. The Jolly Reindeer is made from the finest Thorntons milk chocolate and has a ruby red nose and delicious white chocolate touches while the Snowman is made with yummy white chocolate with a classic carrot nose, green hat and scarf. The Thorntons range of models is available from all major supermarkets. Prices are as follows: Cheeky Elf, 200g (RRP £5.00) and Cheeky Elf, 60g (RRP £2.00), Jolly Reindeer, 200g (RRP £5.00), the Snowman and the Snowdog, 200g (RRP £5.00) and The Snowman Model, 60g (RRP £2.00). Nivea has a number of gift sets for this Christmas, however what caught my eye were their stocking fillers like the 'Festive Treats' which is a nice collection of mini skin care saviours. The set contains a Lip Butter Blueberry Blush, Nivea Soft, Nivea Shower Cream Oil Pearls and Hand Cream Smooth Care. There are a few different variants all priced at £5.50. Another lovely stocking filler is the Luscious Lips collection which is priced at £6.50 and contains four Nivea lip care must haves. Comes packaged in a heart-shaped tin! Another product with a fun packaging is the Nivea Men Crème which is priced at £3. You can pick up these products from most high street retailers.